Here we mingle, introduce ourselves, our thoughts and ideas and have caring discussions. Few people have been as iconic as him, standing for high values of fairness, consideration, discipline and- above all- logic. His ascension into immortality preceded his passing by decades, becoming a kind of guardian angel to those, who have been seeking consolation in the prospect of greater clarity. But how much did we get to know about Leonard Nimoy himself? I sure hope he will forgive most of us, who only ever knew him as Spock. Yet, he was chosen for this role for his presence and that never failed...ehm...well...aside from the Bilbo incident, maybe. But even then, it was quite touching, just in some other places than usual. Immediately I have to think of him playing the Vulcan Harp-thingy in this endearing Star Trek episode that so radically featured the era of its conception. Leaping forward in time, I can honestly say that each time he showed up again in the newer movies, it felt like meeting an old friend, who builds a bridge across all these times, reminding me to be grateful for having been young and for having grown old alike. Beyond the shadow of a doubt, he will be missed very dearly. Love and a light passage to the next round! If you want to add some tribute images here, please, feel free. I'm sure you'll be respectful. 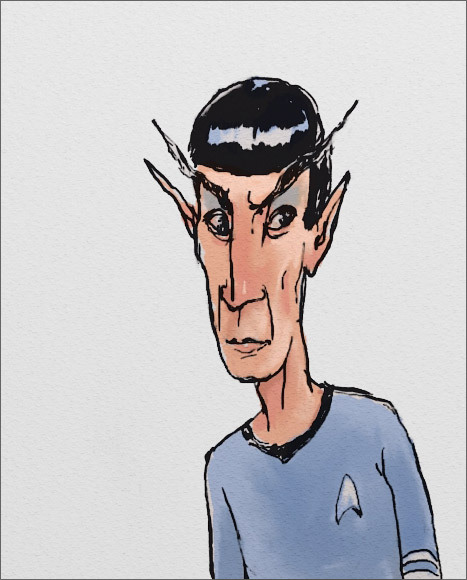 So sad rest in peace dear Leonard Nimoy - alias Mr. Spock. Gone to see beyond the stars! I'm shocked as I have always thought Leonard Nimoy would live 200 years as his character. I drew some homage after the first Star Trek he directed, the one about his resurrection. makes me sad somehow ... even if I did not know him. This one is really great. I love all of the tones in the skin and the green cast in the shadow really sells it. I want to reach out and touch that fur on the parka, haha! Amazing artwork I saw the process too, great tribute indeed. Thanks, yeah, I didn't know how precious this would become soon after.